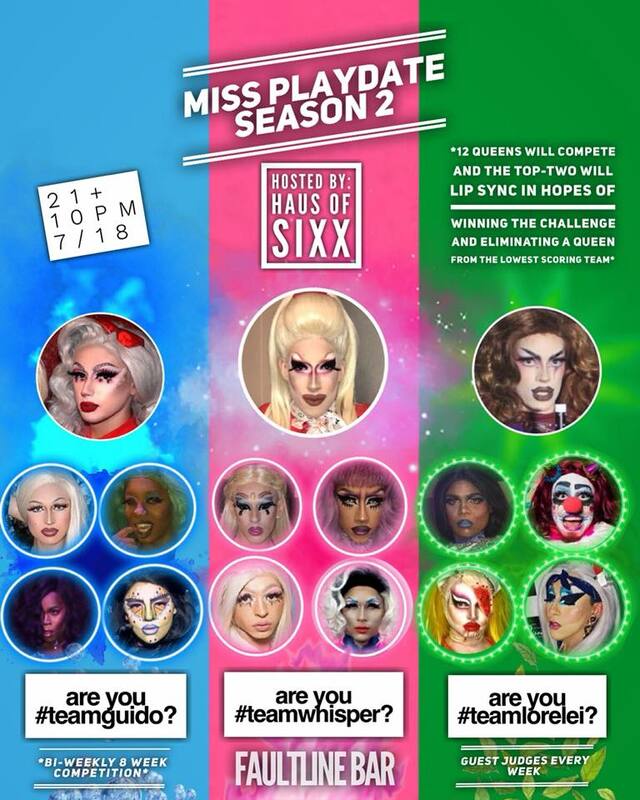 Come to @Faultlinebar on 7/18 for the premier of #MissPlaydate Season two, Hosted by @Hausofsixx! 12 Queens will be competing in an 8 week bi-weekly drag competition, with different themes and guest judges, and only one queen will be crowned #MissPlaydate. To spice things up we’ve decided to split the 12 girls into 3 teams..
#TeamWhisper/@whispersixx: @MiaDosin, @Fvckjuice_, @SedusaRichman, and @Toriperfection. #TeamLorelei/@Loreleithefag: @Frutepunchofficial, @Icecoldkoke, @Espesymone, and @Sovereignangst. #TeamGuido/@Guidontknow: @Sky_diemund, @Officialnubiaeman, @Ronnierios_, and @Infiniti_thedancer.